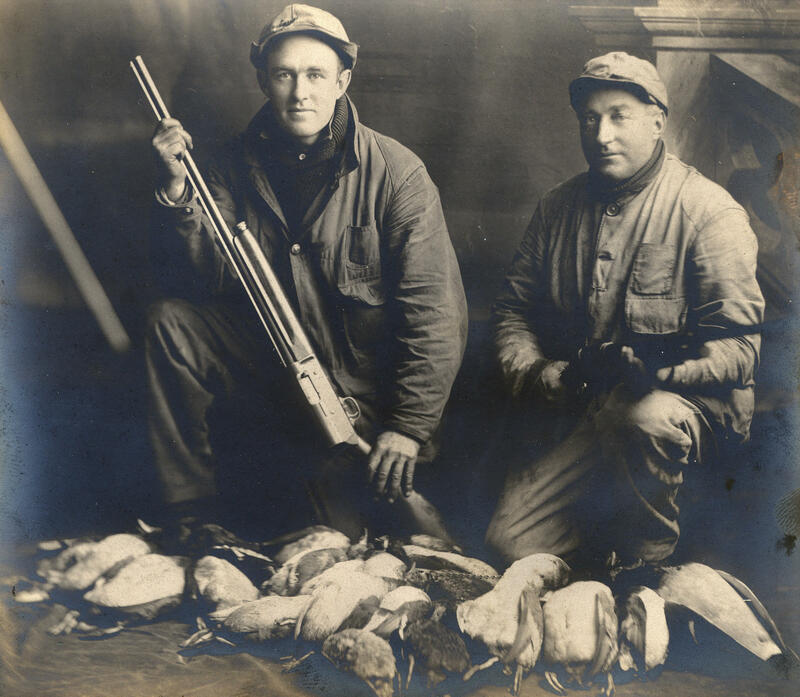 It was once common practice for duck hunters to use live decoys to lure waterfowl. In Wisconsin and other Midwestern states live decoys were used for both goose and duck hunting during the late 1800s up to 1935. Many sportsmen kept a collection of mallards to be used as “live callers.” While a hunter would still have a set of artificial decoys or “blocks” to provide the visual enticement, the primary purpose of the live duck was for calling. The Wisconsin outdoor writer Gordon MacQuarrie, who wrote in the 1920s and 30s, immortalized the use of live decoys in his story “Minnie the Moocher,” a tale of a pair of mallards he collected at a farm near Frederic, Wisconsin, to be used as live decoys for waterfowling. The two ducks, Minnie and Bill, were quite the characters. Min became a deadly caller to every passing male mallard. Bill was known for growling. The use of live decoys could be extremely effective, and measured by the sporting standards of today might seem unsportsmanlike. However, for ethical sportsmen such as MacQuarrie and many others, live decoys had always been a part of duck hunting tradition and were an accepted tool prior to 1935. In addition to MacQuarrie’s story there are some other bits and pieces that document the nearly lost history of live decoys, with an important record coming from Phillip S. Habermann, a noted Madison attorney. Habermann, born in 1913, was a native of Lodi and grew up near the banks of Lake Wisconsin, an impoundment on the Wisconsin River in Columbia County. Lake Wisconsin was created the year he was born, and the lake attracted what he called “fantastic concentrations” of ducks among the dead and half-submerged trees. In 1988 he wrote down his recollections of duck hunting with live decoys in the 1920s: “My father was an ardent duck and goose hunter from 1895 on,” Habermann wrote. “Beginning before WWI he raised more than 100 mallards and six to ten Canada geese each year. The original stock for this flock came from wild birds that were wingshot. This flock furnished our live decoys.” He wrote. As each autumn’s waterfowl season approached, Habermann and his father would scrutinize the flock and pick out the best prospects. “There was a great difference in the talkativeness of the hen ducks,” he recalled. About half a dozen hens were chosen. Some had proved themselves the year before, while some were rookies. The chosen ducks would stay in a separate pen, except during the hunt, until the season’s end. According to Habermann there was a science involved in the tethering of live decoys. “To tether a live decoy while hunting it was essential to have a means of attaching a cord and weight to the duck’s leg in such a manner that it would not harm the duck, and with a device that could remain in place all fall,” he wrote. A half-foot-long, thin, oiled leather strap with two slots at one end and a metal D ring at the other end was part of the rig used. “You wrapped the strap around the duck’s leg, inserted the slotted end through the second slot, then threaded the D-ring end through the first slot and pulled it tight. The strap was locked in place until unthreaded, but could only pull around the leg loosely,” wrote Habermann. When in the field, the hunter attached a heavy chalk line to a five-pound weight and snapped the other end to the D-ring on the duck’s tether. The duck had a six- to ten-foot circle to paddle freely about. Some hunters placed little metal platforms, or stools, in the water for the live decoys to rest on. Just as with the art involved in placing conventional decoys, there was an art to placing the live callers. Habermann wrote that the secret to placing the callers was to position them where they couldn’t see each other. Sportsmen in this day cared for their live callers almost as much as they cared for their hunting dogs. A good caller might be sold for two hundred dollars or more – a lot of money at that time.